For everyone of us there prevails craze concerning sportive items, we file interest and gather news, pictures about it are quite common. Likewise here is a sporty vehicle with all hoped features, especially as a rider he may know well about its efficiency, comfort maintainacne and mainly economical value. If you closely watch you can note that, a fully covered vehicle is better than two wheelers in many aspects safeguarding us from hot, cold or rain from any whether and comfortable ride but those who doesn’t want to switch over to such vehicles for they love riding this kind. 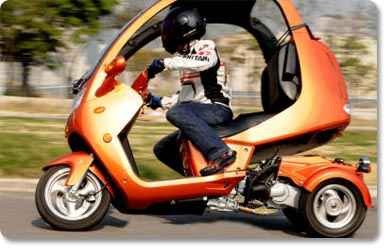 The Auto Moto Corporation developed new vehicle mould of both, scooter / motorcycle and closed vehicle together, attractive with not only with its features but also through its stylish chic look. The Auto Moto 3 wheeled Motor Scooter which gives the look of covered vehicle, designed to operate in any type of weather. The stability of three wheels combined with an integrated roof design to allow the rider to feel the breeze while being protected from the elements, this three wheel motor lets the rider to easily carve corners as if they were on a 2 wheeled machine. The Auto Moto is equipped with a rocking mechanism to ensure the rear wheels stay grounded when turning. Besides, the Anti Lock Braking System (ABS) prevents skidding and the risk of overturning under heavy braking. The rear differential distributes power simultaneously to both rear wheels to improve traction and prevent skidding even in bad weather. The front dual piston caliper and drilled rotors provide extensive braking abilities through the cooling and ventilation provided. The AutoMoto comes with the Honda designed high performance GY6 engine tuned for reliability, fuel economy, low emissions, longevity, and low maintenance. Powered with a standard 150cc single cylinder 4 stroke air cooled engine that propels it in excess of 60 mph. The tandem seat design allows for maximum comfort for both driver and passenger with arm rests for the rear passenger to sit back and enjoy the ride. At $3800, the Auto Moto comes with a one year standard Limited Power Train Warranty.